We’d love your help. Let us know what’s wrong with this preview of the Penitent - Part II by A. Keith Carreiro. Hidden in the bottom of a roadside ditch as a baby, Evangel is only steps away from her viciously murdered parents. An old hermit finds her there a day later and takes her to his home in the heart of a sylvan wilderness. She is raised in a hermitage built by Matthew where he learns she is touched by a rare spiritual power. 17 years later a series of miracles occur that roc Hidden in the bottom of a roadside ditch as a baby, Evangel is only steps away from her viciously murdered parents. An old hermit finds her there a day later and takes her to his home in the heart of a sylvan wilderness. She is raised in a hermitage built by Matthew where he learns she is touched by a rare spiritual power. 17 years later a series of miracles occur that rock the very nature of her reality. Befriended by outlaws and a king’s champion, she is also betrayed by a woman of the cloth during a bard of the realm’s performance. That night, in a dream, Evangel envisions her future soul mate, Pall Warren, on a battlefield of death, and casts a prayer of protection around him. Thus begins a remarkable journey to save herself and those who believe in her. A hauntingly beautiful and startling tale of wonder. To ask other readers questions about the Penitent - Part II, please sign up. From an early age, Evangel's life has never been the same. Saved from an uncertain fate by a hermit, she's grown up to embrace the powers lurking deep inside her. Though she's kept most of what she can do a secret, she knows it won't be long until someone becomes aware of what makes her so unique. Try as she might, she struggles to make sense of what she sees and does. When an unexpected vision shows her a future she knows will come to fruition, she vows to do everything to save the man who hold From an early age, Evangel's life has never been the same. Saved from an uncertain fate by a hermit, she's grown up to embrace the powers lurking deep inside her. Though she's kept most of what she can do a secret, she knows it won't be long until someone becomes aware of what makes her so unique. Try as she might, she struggles to make sense of what she sees and does. When an unexpected vision shows her a future she knows will come to fruition, she vows to do everything to save the man who holds the keys to her own heart. A wonderful addition to the Immortality Wars series, The Penitent: Part II catapults us into the circumstances surrounding Evangel's existence. This is a girl who's had to contend with so much from an early age. She lost her parents, though by the grace of God, she was saved by the loving hermit, Matthew. Since then, he's done his best to be the parent she's never had. Evangel struggles to assert herself throughout everything she sees and does. Her view of the world is an innocent one. At times, it's a little naive. She's come to believe there's goodness in everyone no matter what it is they made do within the lives they lead. That way of thinking is shattered, however, when she witnesses an attempt made on Matthew's life. Despite the fact that she's dealing with so much, she refuses to see the world in black and white. Most especially when it comes to holding the lives of those she loves in the palm of her hand. I love the fact that A. Keith integrates a few events from book one into book two. We get to see more of Pall's plight as he struggles to survive. The fact that Evangel and Pall's lives are so closely intertwined makes the bond they share between them more palpable and definitely much stronger. These are two people who believe in what they do. They'll do anything to make sure every objectives they undertake are fulfilled, no matter the cost. This book far exceeded my expectations, I loved the premise when I read it. The characters are so well developed. It is extremely believable. I love both Matthew and Evangel. Their spiritual growth and strength are what you want to read about in a book like this. At one point, Evangel sees a wolf give birth. The mother and all but three of the pups die. She takes the pups home where she and Matthew raise them. It w I received a copy to facilitate my review. The opinions expressed here are my own. This review has been hidden because it contains spoilers. To view it, click here. Part I of the Penitent was truly amazing!! Part II is even better! New characters are introduced, and the plot thickens...I am looking forward to a Part III...Part II keeps you suspended...Excellent book! 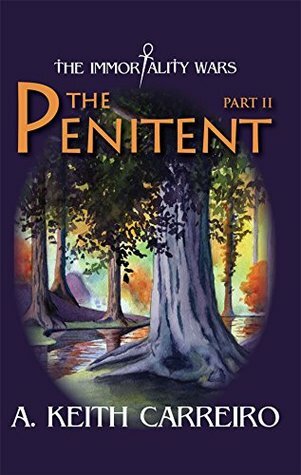 The Penitent: Part II follows Evangel Blessingvale/Greatworth and the revelation of the Risen One. Evangel is saved as a child by Matthew Greatworth, the hermit she calls grandfather. Now seventeen, she is touched by a rare spiritual power when their home is attacked by the Dread Rovers and Matthew is tortured. Evangel is faced with opposition from the Priory when news of her miraculous meeting with The Risen One spreads, as the religion has long been outlawed in the country--on pain of death. T The Penitent: Part II follows Evangel Blessingvale/Greatworth and the revelation of the Risen One. The Christian themes are presented much more clearly in this part, with the obvious Risen One as the Christ figure. Part 2 moves forward more fluidly too--there are fewer flashbacks as Carreiro focuses on the current events of miraculous salvation, changed lives and spreading of the good news. There isn't much interlinkage between Part 1 and 2--you can almost read them as standalone stories--as the only mention of anything from Part 1 comes in the last two chapters when Evangel has a vision of Pall Warren. There's a coming Part 3 which should round out the story, but I'm not quite sure what's the status of that.